Sarif is a platformer game with a twist (literary). In the game you play as Roth a guy who has finds himself stuck in a computer named Sarif. After a while he remembers why he was there in the first place. It turns out that he and his team were experimenting with virtual reality but something went wrong. The primary game mechanic is shifting gravity. It is now up to Roth to get all the fragmented Q-bit's, that is if he wants to get out. In the computer there are 50 Segment's (levels) that each contains a Q-bit you must guid Roth through these segment's by running, jumping and shifting gravity. 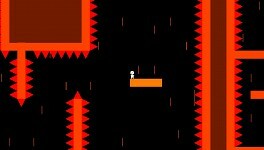 ZoHrK Softworks, in association with clay.io, brings you the gravity shifting platformer puzzle game . . . SARIF. Ok enough of the sales pitch. Sarif the game launched today and is completely free. You dont even have to download it all you have to do is head over to sarif.clay.io/index.html and invest a bit of time to check it out. 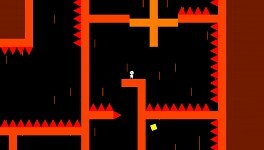 Leaderboard's- compete against the toughest 10 year old web gamer's you have ever seen. Achivement's - Makes you feel like your actualy worth something. Difficulty - Man this game is hard. Simplicity - Easy to learn HARD to master. Gravity Shifting - Unfortunately Newton dissaproves this game.